Attendance is mandatory, and unexcused absences are reported to the referral source. Youth who are referred through a Juvenile Diversion program with a District Attorney’s office may have their offense removed from their record. In order to do so, students must graduate from the program and complete a successful follow-up period of one year without re-offending. District Attorneys may also consult with other law enforcement agencies and school administrators to verify positive progress. 83% or more of students who enroll in Bridging the Gap through the District Attorney’s office achieve this level of success. 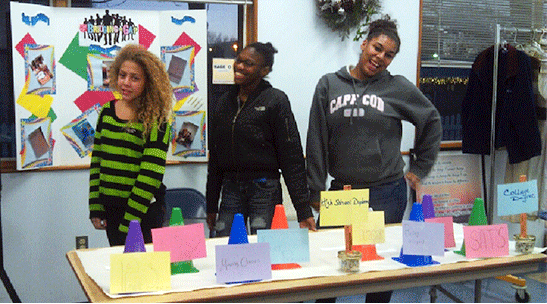 Three students create a visual representation of roadblocks to receiving an education. Bridging the Gap focuses on life skills development, and sessions also include various opportunities for tutoring and mentoring support, exposure to music and the arts, visits to local businesses and colleges, community service projects and other educational activities. Students make a commitment to improving their grades, and they must report back on their school assignments, test scores, tutoring needs and school behavior. A vast majority of students continue their education after completing the program and their awareness of new opportunities coupled with a greater belief in themselves increases the likelihood of obtaining their high school diploma or GED, going to college, and beginning a career. Bridging the Gap seeks to prevent future involvement in illegal, self-destructive and other risky activities for all youth participating in the program. Students learn the importance of decision-making, situational analysis and group support systems, resulting in improved self-esteem and reduced confrontation with peers; stronger communication, trust and understanding in relationships with friends, parents and figures of authority; the demonstrated ability to use anger management skills and conflict resolution techniques; improved attendance and performance in school; the ability to recognize and desire to develop natural talents and abilities; and a sense of responsibility for being a productive member of the community through service and involvement. Students are provided with follow-up support for at least one year after graduating from Bridging the Gap.